Posted on 03/26/2014 by Marilyn F.
Please join us for our April meeting on Sunday, April 13th at 1:30. 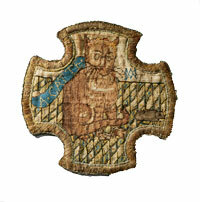 The program will be a lecture on Mary Queen of Scots and Her Embroidery given by Kathy Matthews. For centuries, many have been fascinated by Mary’s tragic life. Kathy Matthews has studied the Queen’s life and her embroidery for over ten years. This study led to her interest in Scottish Samplers which was the subject of her Master Judge Certification project for the American Needlepoint Guild which was presented in 2011. Kathy’s lecture will focus on the collections of Mary’s embroidery she has recently visited in both England and Scotland.